suitcase | Live Life. Create Dreams. 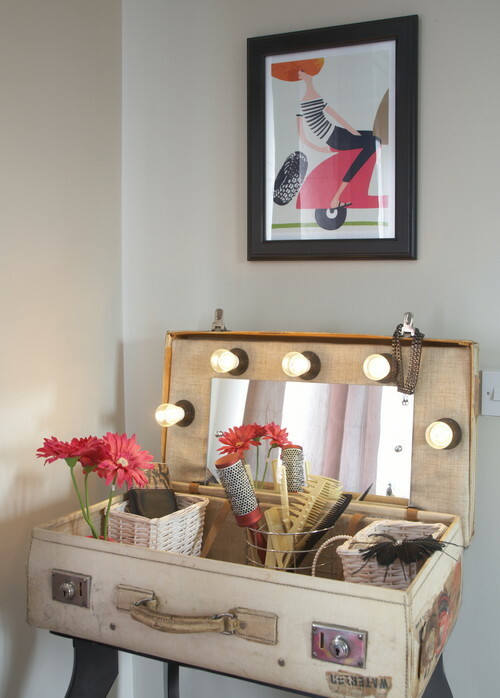 Anyone who is a fan of DIY vintage furniture and Pinterest has seen those darling vintage suitcase tables. 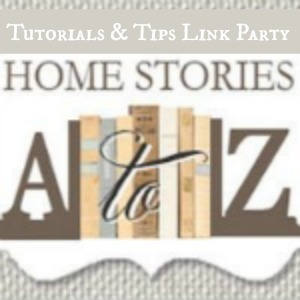 There are even a few leads to a semi tutorial on Pinterest. However, I have yet to find one with full details, not to mention photos of the interior. 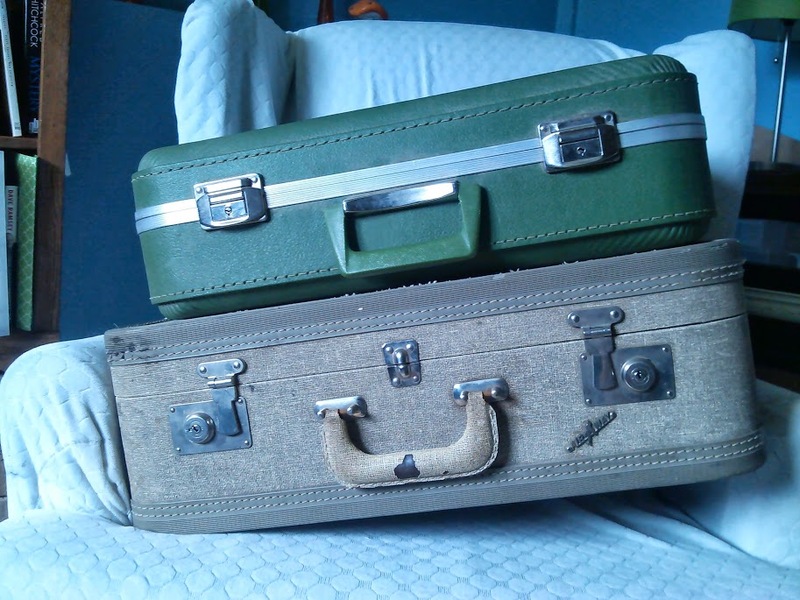 About two months ago I found two fantastic vintage suitcases. 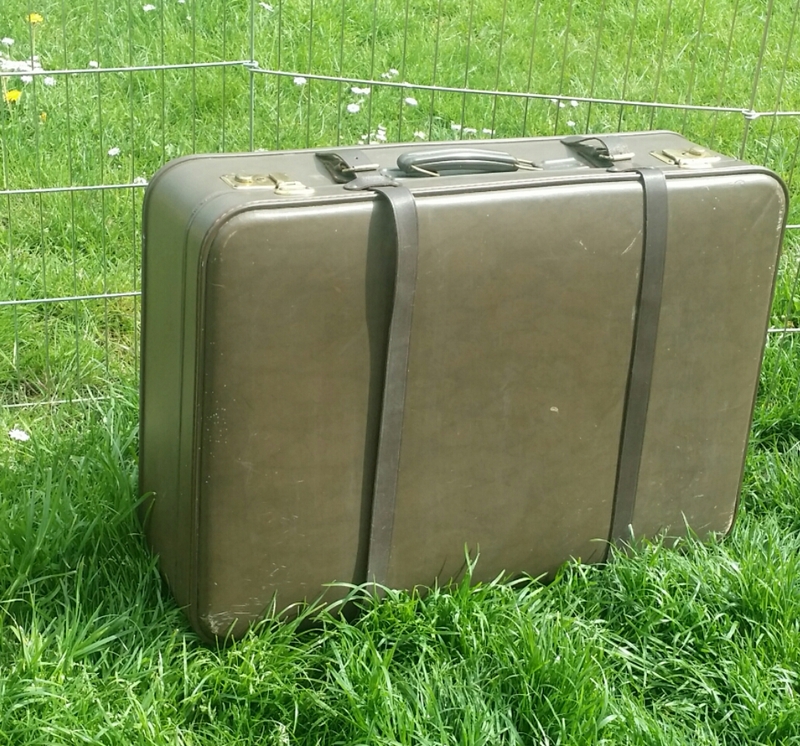 The tweed suitcase is from the 1940’s and the interior was in bad shape. But it was only $10 at my local ARC Thrift store. I bought them with the intention turning them into tables. I also found two great mid-century modern end tables at the thrift store–for $4 each! I put the project off for a while because I wanted to find the perfect fabric for the interior. I had finally given up my search for the perfect fabric when I realized that I had a tablecloth that I had found on clearance at Target for around $3 last year. So I finally got to work on the suitcase. It turned out to be a lot more work than I had thought it would be. 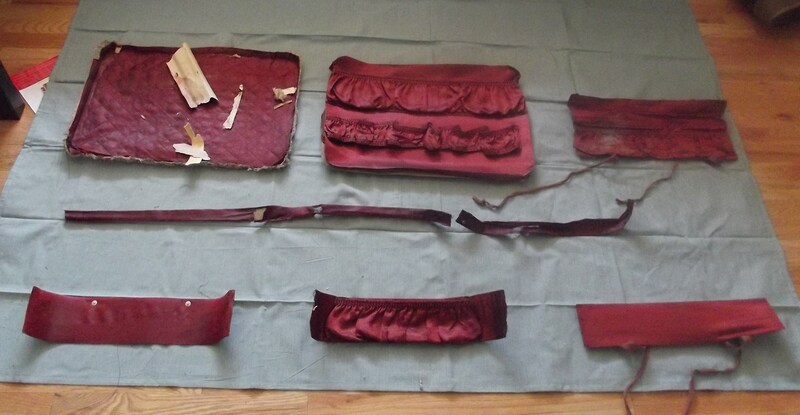 First, I had to rip out the old interior–which wasn’t so hard because it was peeling off everywhere. I could have sworn that I took a pic before I started tearing out the interior–but alas it is NOT on my camera. So here is a partial pic for you to enjoy. The interior is still quite a mess–even after a mild scraping. This is what the interior pieces looked like before I prepped them for cutting. Though I liked the satin fabric, I wasn’t a fan of the color. And they were SUCH a mess! *Take note that the longer piece was supposed to cover the back of the suitcase where the hinges are (from the bottom to the top). After cutting out the edging, I wanted to give it a dry fit. Yeah, that is NOT right! I must admit that when I began this “little” project it was almost midnight and I’m not sure that my logic center was awake. Instead of trying again, I just cut the excess off. 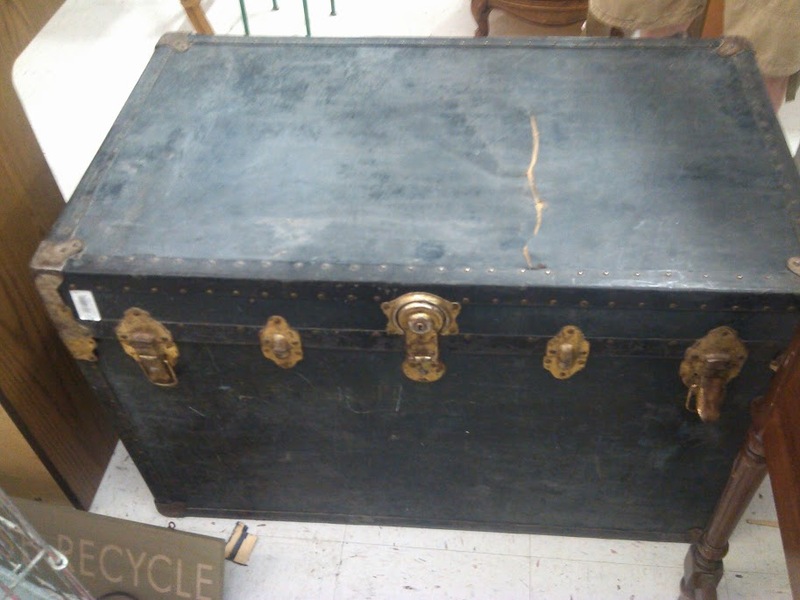 I figured it would probably look ok without the long piece to cover the hinges. So I carried on. 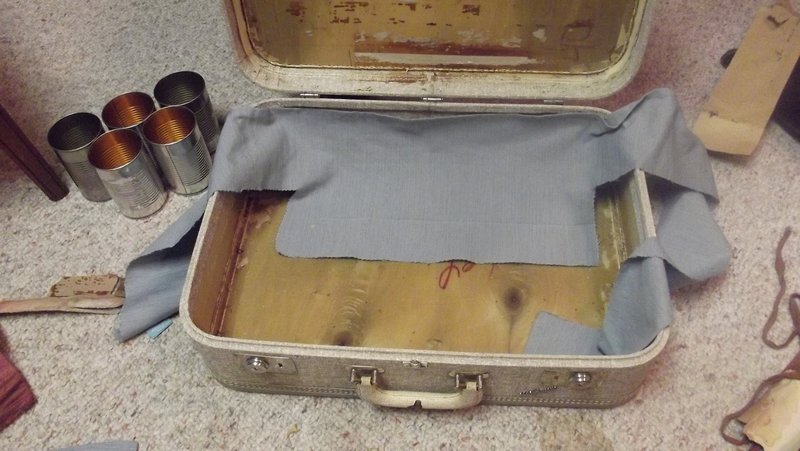 I really wanted to make sure that I lined up the seam of the fabric with the seam of the suitcase for a more professional look. 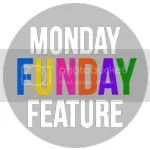 *Note–the picture above most accurately reflects the color of the fabric. 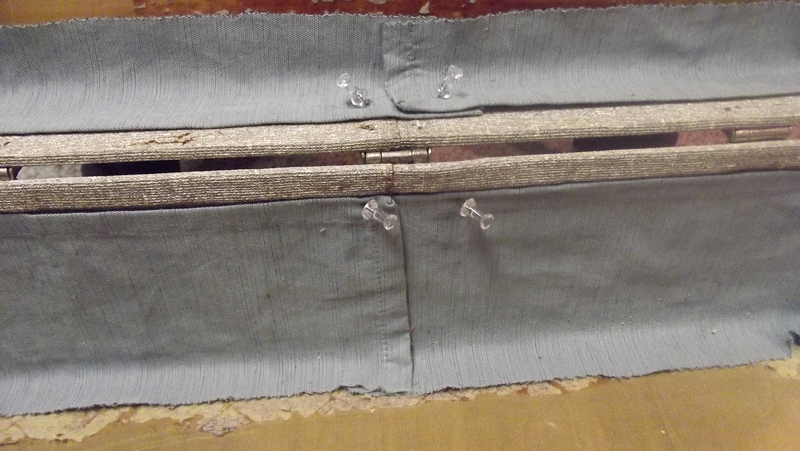 Using push pins, I placed the fabric just beneath the “lip” of the suitcase interior. 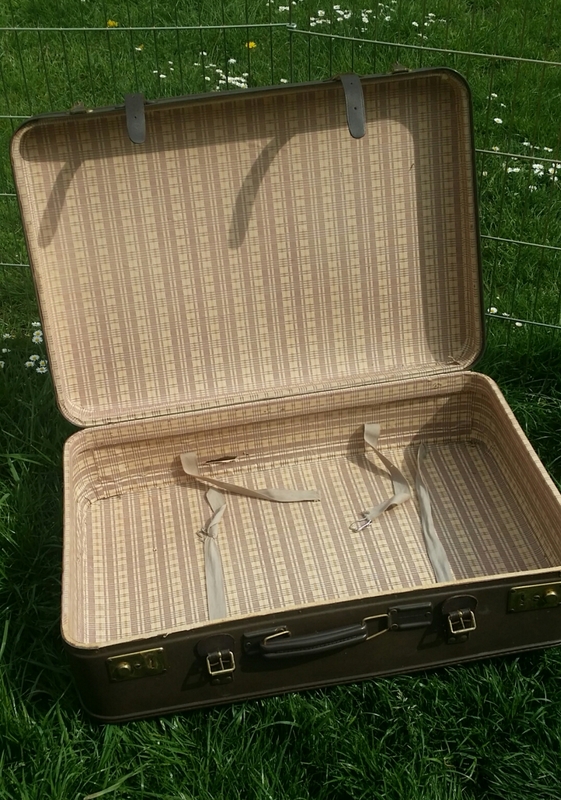 Be careful not to push the pins in too far–you don’t want to puncture the suitcase. I did run into another snag while I was dry-fitting the edging. 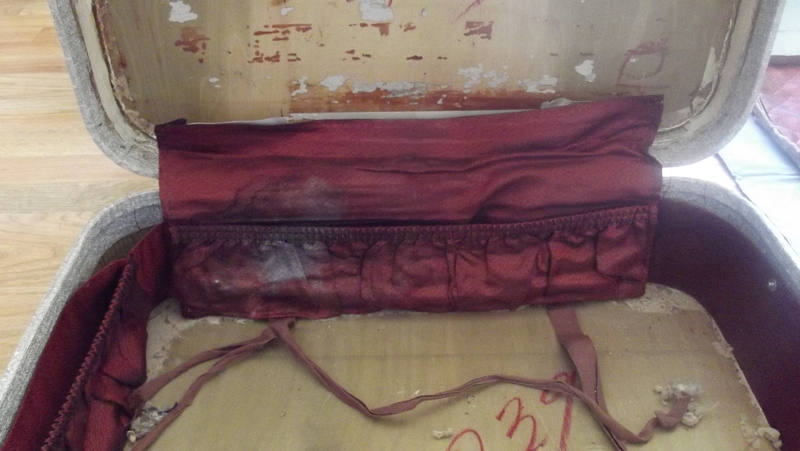 The suitcase has two little hooks that perhaps at one time held a divider in place. i pinned around over them and decided that I would figure out how to integrate them later. I really liked the way it looked and fit. Next up was pinning and cutting out the top and bottom interior pieces. I also dry-fit the top and bottom pieces, crossing my fingers that it would work (I really didn’t have the energy to try again if it didn’t). i folded the raw edges under to give it a clean look. Perfect! But I really wish I had started with the top and bottom pieces first! Would have made life easier. Still avoiding a thorough cleaning of the suitcase, I decided to work on the vintage table in the morning. It was easy to disassemble. The tabletop was screwed into the wood base with 9 screws. I love the top so much, that I am thinking about turning it into a tray–but that is a project for another day. I sanded the legs down with 100 grit sandpaper, followed by 120 and 150. The wood was gorgeous. Initially I had thought that it was made from pine and stained a dark cherry. Nope–it IS cherry wood! So after using a tack cloth to remove all of the dust & grit, I coated the legs and base with Minwax Polycrylic Protective Finish. I really love water based products–clean-up is so easy! Absolutely beautiful! I just knew the table base would look fantastic with the suitcase. No longer able to avoid the inevitable, I set out to clean the suitcase while the table base cured. Does polycrylic cure, set, or just dry? Well whatever the correct term is–I gave it a whole day. I really don’t know why I was avoiding cleaning out the suitcase. With a putty knife, a wire brush, and a little elbow grease, it cleaned up quickly and nicely. 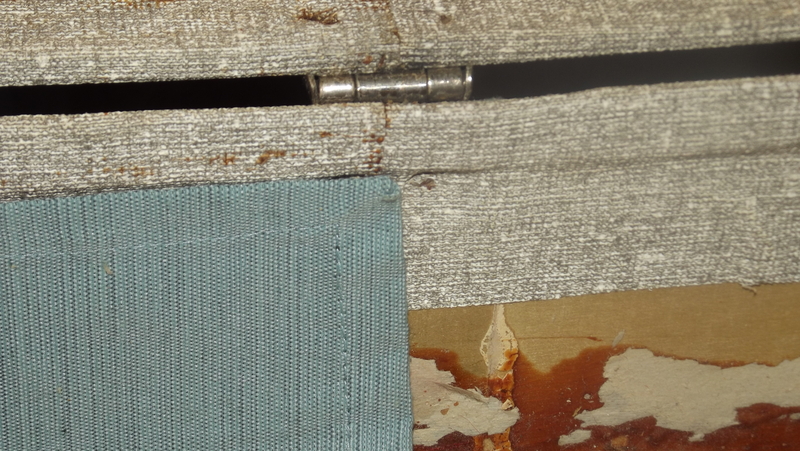 Since I’m covering the interior with fabric, I wasn’t too worried about the bits that didn’t want to come off. Now it was time to finish the suitcase table. 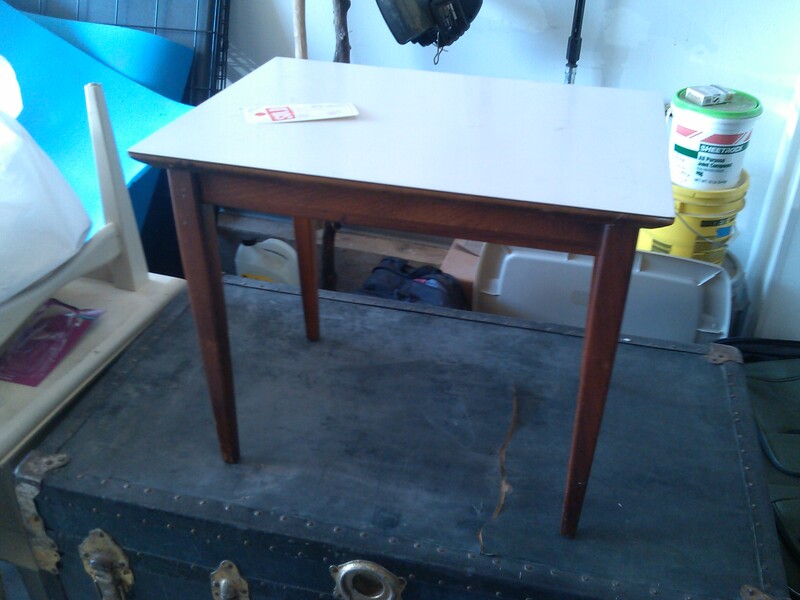 I measured the exterior and the table base at least 5 times (because I am that paranoid about screwing it up). Then I realized that I needed to find the center point of the suitcase and the table base. Okay, I’m not great at math and studied extra hard with tutors just to get a “B” in Liberal Arts Math. I’m not dumb, but when it comes to math my brain wants to shut down. Anybody remember Windows’ Blue Screen of Death? Yup, that’s my brain with math. I Turned my suitcase upside down and placed the table base on top. I measured from the outer edge of the table base to the inner edge (where the rubber edging started) and the center of each side to center the table base on the suitcase. 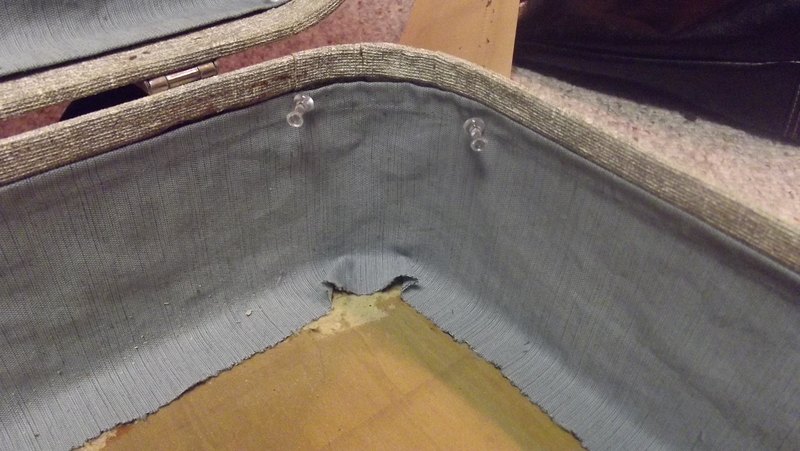 When I had the table centered over the suitcase, I had someone hold it in place while I drilled the holes. I thought that it would be easiest to work with the top of the suitcase before screwing it into the table base, so I went ahead and glued the fabric to the top of the suitcase at this time. Having learned from the dry fitting, I glued the top piece in before I started on the edges. I used hard coat Mod Podge. 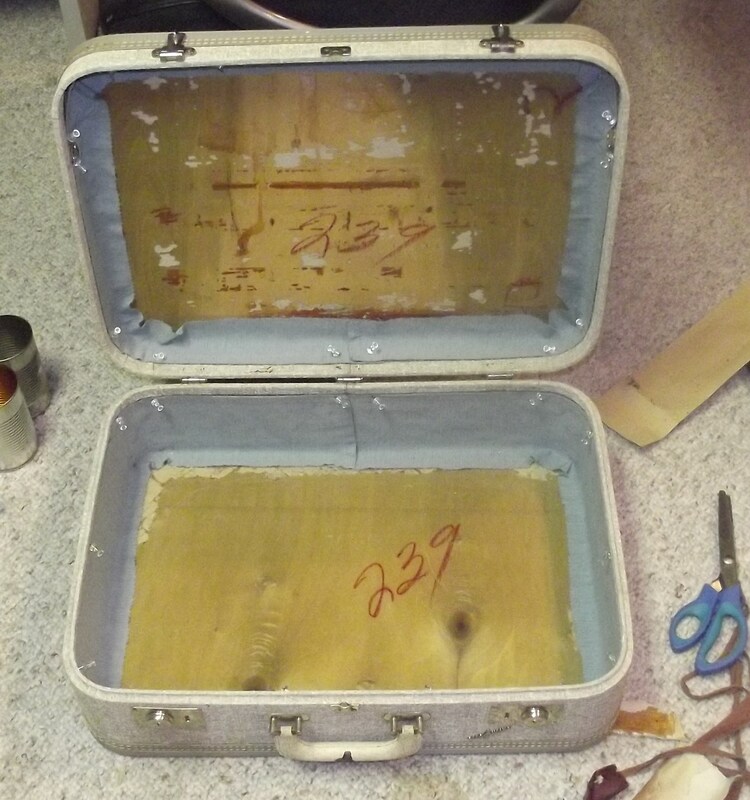 I coated the entire “top” of the suitcase in Mod Podge, making sure that to do a heavy coating around the edges. I began on the center edge and smoothed it up, down, and outwards as went across the surface. I also made sure to add a little extra up the sides to ensure good coverage. Next, I started on the edging. *Note* I learned the hard that I should have at least used the no sew hem tape on the raw edges before I began. If I were to do this again, I would have pinned the raw edge while doing the dry fitting. Remember those little hooks? I cut a slit in the fabric, close to the finished edge and slipped the hook through it. Worked out well. 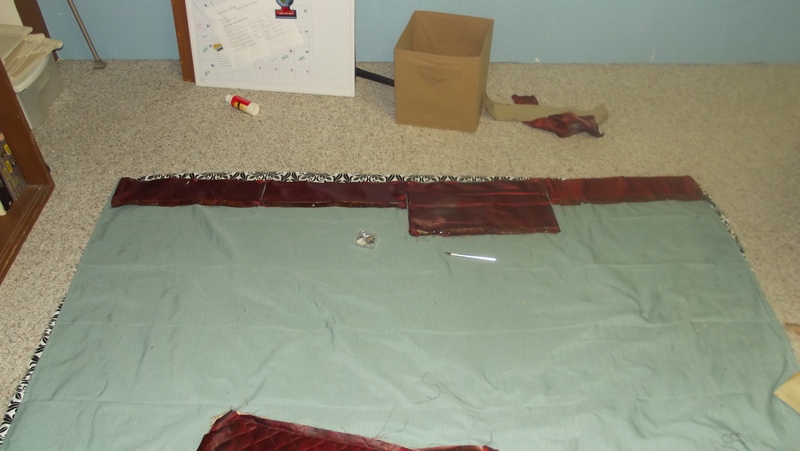 After all of the edging is done, let it dry for about 15 minutes, then seal the fabric with a top coating of Mod Podge. After the top coat of Mod Podge was applied, I used the push pins around the corners and along the seam to hold the fabric in place while it dried. Once the top was dry, I screwed the suitcase onto the table. It is finally time to add the fabric interior. Again, I started with the main surface piece and used the process as I did with the top. Now you have a fantastic and unique accent or end table. I’ve been a busy bee lately. 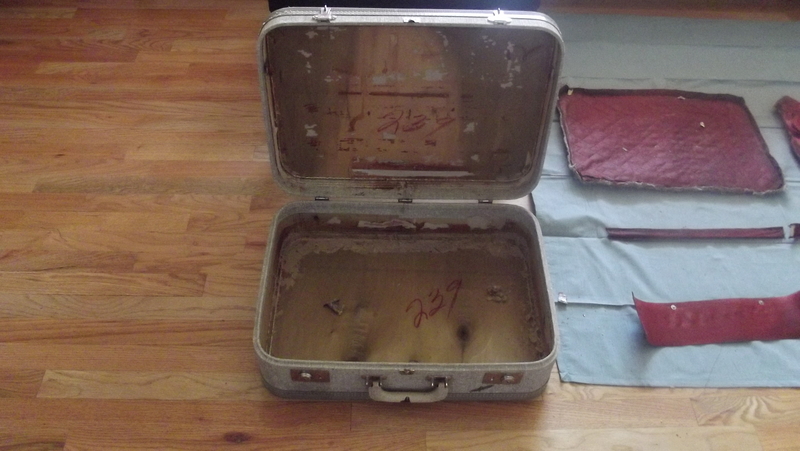 Found these great vintage suitcases today for a new project that I have planned. 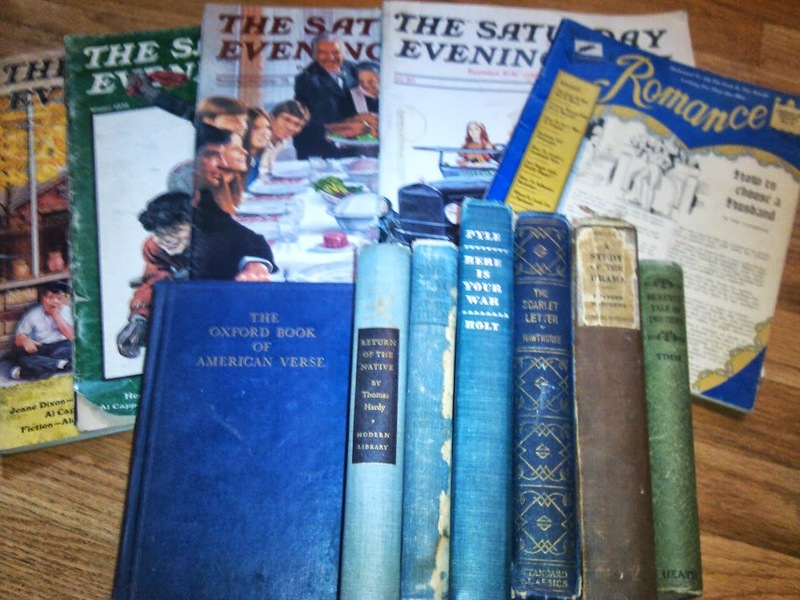 These tasty treats were just sitting on the bottom shelf in the book section at the thrift store so I just HAD to bring them home. And this lovely beauty caught my right away. I’ve been looking for her for years! Once I laid eyes on her, I knew she would be mine.